Crowdsouring Planet Hunters X. KIC 8462852 - Where's the Flux? Over the duration of the Kepler mission, KIC 8462852 was observed to undergo irregularly shaped, aperiodic dips in flux down to below the 20% level. The dipping activity can last for between 5 and 80 days. We characterize the object with high-resolution spectroscopy, spectral energy distribution fitting, and Fourier analyses of the Kepler light curve. We determine thatKIC 8462852 is a main-sequence F3 V/IV star, with a rotation period ~0.88 d, that exhibits no significant IR excess. In this paper, we describe various scenarios to explain the mysterious events in the Kepler light curve, most of which have problems explaining the data in hand. By considering the observational constraints on dust clumps orbiting a normal main-sequence star, we conclude that the scenario most consistent with the data is the passage of a family of exocomet fragments, all of which are associated with a single previous breakup event. We discuss the necessity of future observations to help interpret the system. Continue reading Crowdsouring Planet Hunters X. KIC 8462852 - Where's the Flux?. 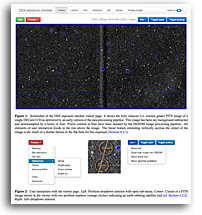 "We have developed a crowdsourcing web application for image quality control employed by the Dark Energy Survey. Dubbed the "DES exposure checker", it renders science-grade images directly to a web browser and allows users to mark problematic features from a set of predefined classes. Users can also generate custom labels and thus help identify previously unknown problem classes. User reports are fed back to hardware and software experts to help mitigate and eliminate recognized issues. We report on the implementation of the application and our experience with its over 100 users, the majority of which are professional or prospective astronomers but not data management experts. We discuss aspects of user training and engagement, and demonstrate how problem reports have been pivotal to rapidly correct artifacts which would likely have been too subtle or infrequent to be recognized otherwise. We conclude with a number of important lessons learned, suggest possible improvements, and recommend this collective exploratory approach for future astronomical surveys or other extensive data sets with a sufficiently large user base." "How can Earth observation research explore the new challenges and opportunities created by the rapid advances in information and communications technologies? The world of Earth observation data is swiftly changing, driven by the availability of open data and by the rapid advances in digital technologies, which can be used for their exploitation. The first Earth Observation Open Science 2.0 conference, organised by ESA, explored and discussed the emerging challenges and opportunities faced by the Earth observation scientific community, with the objective of gathering feedback on new trends and practices by next-generation scientists. Open tools and software, data-intensive science, virtual research environment, citizen science, advanced visualisation, e-learning and education of the new generation of data scientists were covered at this Community Consultation Meeting at ESA's centre in Frascati, Italy on 12-14 October." "It is time to start listening to space. To celebrate the launch of the student-built AAUSAT5 CubeSat from the International Space Station into low Earth orbit, ESA's Education office challenges the amateur radio community to listen out for the tiny satellite. Be the first to send in your recorded signal from AAUSAT5 and you will receive a prize from ESA's Education Office. Launched on 19 August to the ISS, the Danish student CubeSat is now waiting for its deployment from the Japanese Kibo module's airlock. Sometime in the week of 5 October, an astronaut will manipulate a robotic arm to lift AAUSAT5 from the airlock and place it in orbit. Once launched from the International Space Station the CubeSat will begin transmitting signals to Earth that can be picked up by anyone with common amateur radio equipment." "NASA is giving university and college students an opportunity to be part of the agency's journey to Mars with the Breakthrough, Innovative, and Game-changing (BIG) Idea Challenge. NASA's Game Changing Development Program (GCD), managed by the agency's Space Technology Mission Directorate in Washington, and the National Institute of Aerospace (NIA) are seeking innovative ideas for generating lift using inflatable spacecraft heat shields or hypersonic inflatable aerodynamic decelerator (HIAD) technology." "A new NASA challenge is looking for evidence to support a theory that electromagnetic pulses (EMP) may precede an earthquake, potentially offering a warning to those in the quake's path. The "Quest for Quakes" two-week algorithm challenge seeks to develop new software codes or algorithms to search through data and identify electromagnetic pulses that may precede an earthquake. Some researchers have speculated such pulses originating from the ground near earthquake epicenters could signal the onset of some quakes. "Developing a reliable approach that can separate potential earthquake-induced electromagnetic pulses from the myriad of natural and anthropogenic sources has been a significant challenge," said Craig Dobson, program scientist at NASA Headquarters in Washington. "We look forward to seeing the innovative ideas from this competition and learning more about this controversial phenomenon."" "Science-team members for NASA's Mars Reconnaissance Orbiter are soliciting help from the public to analyze exotic features near the south pole of Mars. By categorizing features visible in images from the orbiter's Context Camera (CTX), volunteers are using their own computers to help the team identify specific areas for even more detailed examination with the orbiter's High Resolution Imaging Science Experiment (HiRISE) camera. HiRISE can reveal more detail than any other camera ever put into orbit around Mars. Planet Four: Terrains is on a new platform released by the Zooniverse, an organization that currently hosts 30 projects that enlist people worldwide to contribute to discoveries in fields ranging from astronomy to zoology. The new platform is designed to make it easier than ever for a researcher needing help with data analysis to set up a task to involve volunteers." "NASA is turning to the public and crowdsourcing for outside-the-box thinking about human space exploration challenges with a series of 10 new NASA Open Innovation Service (NOIS) Contracts. The first challenges to be launched under the new contract will seek new algorithms to improve Robonaut's tool use in novel ways that could take advantage of materials found on asteroids, the moon or Mars for both space and Earth applications. Future challenges will seek help in developing improved textiles for planetary exploration spacesuits and other useful technologies as NASA continues its evolvable Journey to Mars strategy. The total value of all contracts combined is $20 million over five years." "As millions of people regroup from the impact of the earthquakes in Nepal, a team of international volunteers is combing through satellite imagery of the region to identify additional hazardsearthquake-induced landslides. As part of a disaster relief response to the 7.8-magnitude Nepal earthquake and its aftershocks, Kirschbaum and Jeff Kargel, glaciologist at University of Arizona, are leading a group of volunteer scientists identifying where and when the landslides are occurring in earthquake-affected areas. Together, the team has mapped nearly one thousand landslides from April 25, the date of the first earthquake, to May 20." NASA Issues Opportunities to Advance "Tipping Point" and "Emerging Space Technologies"
"NASA has announced two opportunities for public-private partnerships to achieve the agency's goals of expanding capabilities and opportunities in space. Through both solicitations, NASA is seeking industry-developed space technologies that can foster the development of commercial space capabilities and benefit future NASA missions. "These solicitations form an increased focus on collaborations with the commercial space sector that not only leverage emerging markets and capabilities to meet NASA's strategic goals, but also focus on industry needs," said Steve Jurczyk, associate administrator for the Space Technology Mission Directorate at NASA Headquarters in Washington. "While developing the technology to enable NASA's next generation of science and human exploration missions, we will grow the economy and strengthen the nation's economic competitiveness." "From a voice and gesture command system for spacecraft, to an app that provides farmers information about their crops' health, this year's winners of the International Space Apps Challenge cover a wide range of technology solutions for space exploration and life on Earth. NASA, in conjunction with other space agencies around the world, held the fourth annual code-a-thon April 10-12 at more than 135 locations worldwide and the results are in. Winning apps were selected in six categories, including a People's Choice Award. Participants were asked to develop mobile applications, software, hardware, data visualization and platform solutions that could contribute to space exploration missions and help improve life on Earth. This year, 35 challenges represented NASA mission priorities in four areas: Earth studies, space exploration, human health research and robotics. The categories and winning apps are:"
"For the first time, space is not longer the exclusive preserve of advanced technology institutes and scientists. Isro's Space Application Center (SAC) has invited engineering institutes across the country to share their research ideas at a workshop on April 28 at Ahmedabad on the best possible ways of using its NEMO-AM satellite observations and for developing critical technologies for such missions in the future. Next Generation Earth Monitoring and Observation Aerosol Monitoring (NEMO-AM) is one of Isro's most crucial next generation high-performance 'micro-satellite' (small satellite) missions. The satellite weighs just 15 kg with dimensions of 2.2 ft length, 2 ft breadth and 1 ft in height. It will be launched at an altitude of 500 km above the earth. The project is a joint venture of Isro with the Space Flight Laboratory (SFL) of the University of Toronto Institute for Aerospace Studies." "Developers of apps that use satellite data to assist the agricultural industry took home the top two prizes at this year's ESA App Camp in Barcelona. The App Camp offers access to the latest space data and the SAP HANA Cloud Platform to European app developers, who work to make the information accessible to a broad audience." National Oceanic and Atmospheric Administration (NOAA)'s academic partner, the Space Science and Engineering Center (SSEC) at the University of Wisconsin-Madison has developed two free mobile apps that bring the ability to see and capture satellite data to mobile users' fingertips. The apps received development support from NOAA and NASA. The SatCam app for iOS devices allows mobile users to capture observations of sky and ground conditions at the same time that an Earth observing satellite is overhead. The WxSat (short for Weather Satellite) app, for iOS and android, displays and animates full-resolution, real-time weather satellite data. WxSat leverages the SSEC Data Center holdings to provide global coverage for visible, infrared, and water vapor channels. Continue reading Weather and Environmental Satellite Crowd Sourcing: Two New Apps. "Einstein@Home currently processes PALFA Mock spectrometer data from Arecibo Observatory. This search run is called "BRP4" (short for Binary Radio Pulsar search #4). It uses the computing power donated by volunteers from all over the world to search the Arecibo data for radio pulsars in binary orbits. Thanks to the enormous amount of donated computing power Einstein@Home conducts the search with the highest sensitivity to pulsars in very tight binary systems. This page lists the detections of known and new pulsars identified from this processing. In the tables below you'll find information for each pulsar." "Einstein@Home uses your computer's idle time to search for weak astrophysical signals from spinning neutron stars (also called pulsars) using data from the LIGO gravitational-wave detectors, the Arecibo radio telescope, and the Fermi gamma-ray satellite." MilkyWay@home is a volunteer computing project that allows people from every country in the world to volunteer their otherwise idle processors to Milky Way research. Currently, more than 25,000 people (150,000 since November 9, 2007) contribute about half a PetaFLOPS of computing power to our project. We currently run two types of applications: one application fits the spatial density profile of tidal streams using statistical photometric parallax, and the other application finds the N-body simulation parameters that produce tidal streams that best match the measured density profile of known tidal streams. "The SETI Institute has partnered withEchoUser, SpaceGAMBIT, Maui Makers, the Minor Planet Center, NASA, and Further by Design to host an Asteroid Hackathon on Saturday, Oct. 25. Using the world's best sources for asteroid data, hackers from all over the world will transform data into digestible, visual information for citizen scientists, allowing them to help save the planet from rocky space invaders." December 15 - 19, 2014. "The IAU invites all public organizations with an interest in astronomy to register on the IAU Directory for World Astronomy website for the NameExoWorlds contest, where they will in early 2015 be able to suggest names for exoplanets and their host stars. For the first time in history the public will then be able to vote for the official names of stars and planets." After ISEE-3: What Other Old Space Stuff Might Be Rebooted? 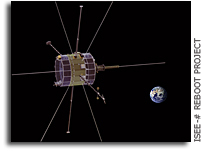 Although ultimately short-lived, the ISEE-3 project demonstrated the enthusiasm and resources available for private space endeavours. What other projects might follow? The sky is the limit - perhaps even involving the three lunar rovers sitting on the moon since the early 1970s. Only new batteries are needed to bring them back to life, so perhaps well-funded space tourists will, in a few decades, be able to not just fly to the moon but drive on it when they get there. "The knowledge commons research framework is applied to a case of commons governance grounded in research in modern astronomy. The case, Galaxy Zoo, is a leading example of at least three different contemporary phenomena." "The most productive citizen astronomy projects involve close collaboration between the professionals and amateurs involved, and occupy scientific niches not easily filled by great observatories or machine learning methods: citizen astronomers are most strongly motivated by being of service to science. In the coming years we expect participation and productivity in citizen astronomy to increase, as survey datasets get larger and citizen science platforms become more efficient. Opportunities include engaging the public in ever more advanced analyses, and facilitating citizen-led enquiry by designing professional user interfaces and analysis tools with citizens in mind." "Digitizing the ~500,000 glass plate images covering the full sky will foster new scientific discoveries for the currently 'hot' field of studying variability of astronomical objects, or time domain astronomy, as we bring to light these long-hidden archives," says Harvard professor Josh Grindlay, the leader of the Digital Access to a Sky Century at Harvard (DASCH) project. The telescope logbooks record vital information associated with a 100-year-long effort to record images of the sky. By transcribing logbook text to put those historical observations in context, volunteers can help to unlock hidden discoveries." "NASA has selected four ideas from the public for innovative uses of climate projections and Earth-observing satellite data. The agency also has announced a follow-on challenge with awards of $50,000 to build climate applications based on OpenNEX data on the Amazon cloud computing platform. Both challenges use the Open NASA Earth Exchange, or OpenNEX, a data, cloud computing, and knowledge platform where users can share modeling and analysis codes, scientific results, information and expertise to solve big data challenges in the Earth sciences. OpenNEX provides users a large collection of climate and Earth science satellite data sets, including global land surface images, vegetation conditions, climate observations and climate projections." "Public engagement (PE) initiatives can lead to a long term public support of science. However most of the real impact of PE initiatives within the context of long-term science policy is not completely understood. An examination of the National Aeronautics and Space Administration's (NASA) Hubble Space Telescope, James Webb Space Telescope, and International Sun-Earth Explorer 3 reveal how large grassroots movements led by citizen scientists and space aficionados can have profound effects on public policy. We explore the role and relevance of public grassroots movements in the policy of space astronomy initiatives, present some recent cases which illustrate policy decisions involving broader interest groups, and consider new avenues of PE including crowdfunding and crowdsourcing." "With the help of a distributed science project called Stardust@home, volunteer space enthusiasts from around the world combed through the video, flagging tracks they believed were created by interstellar dust." "A critical aspect of this was the dedication and hard work of the citizen scientists who worked on this," Westphal said. "We couldn't have done it without them." In fact, two of those Dusters, Bruce Hudson from Midland, Ontario, Canada, and Naomi Wordsworth from Wexbury, South Buckinghamshire, United Kingdom, were allowed to name the interstellar particles they found: Orion and Hylabrook, respectively. They are listed with the 66 scientist co-authors of the Science paper. Weshphal himself discovered the third interstellar dust track in the aerogels and called it Sorok, the Russian word for 40, the number attached to the track."